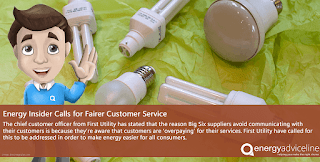 The Energy Advice Line has welcomed calls by an industry insider for the Big Six suppliers to introduce simple changes that would see customers paying less for their energy, and being treated more fairly. Julian Morgan, managing directer of the price comparison, switching, and advice service for energy users, said regulators should heed the comments by First Utility, a leading independent supplier, and enforce the changes. "First Utility has echoed what we have been saying for some time - that energy companies need to make simple changes, like actually talking to their customers, in order to restore trust and deliver them a better deal," Mr Morgan said. "We hope that Ofgem takes on board what this supplier is saying and apply the recommendations across the market - and crack down on those who don't fall into line." 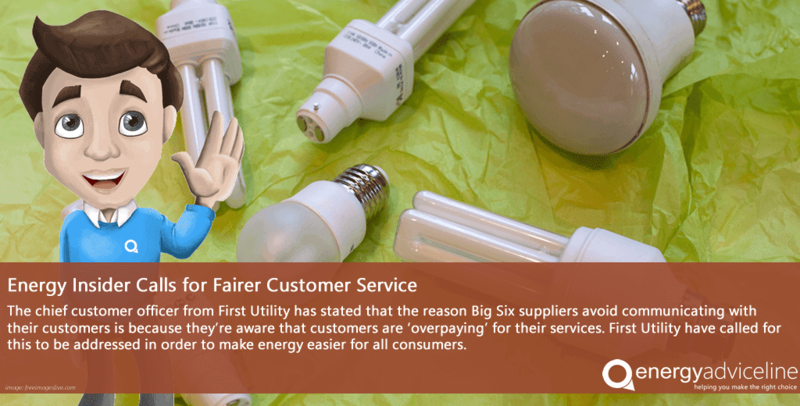 Ed Kamm, chief customer officer at First Utility, has claimed that the Big Six suppliers avoid communicating with their customers because they know customers are "overpaying". Mr Morgan said all of the recommendations, especially making switching easier, could transform the relationship between customers and suppliers that had suffered so badly in recent years. "If suppliers were customer-focused rather than profit-focused, all parts of the energy market would benefit, including suppliers themselves," Mr Morgan said. "Customers should be told when cheaper deals are available, their tariffs should be simple to understand and it should be simple to change supplier if there are cheaper deals elsewhere. "But this is not the way it works in practice. Suppliers have built their business models on discouraging customers from engaging with them or taking a pro-active approach to their energy supplies. "It's got to change and we hope Ofgem takes heed of what this industry insider has to say." The Energy Advice Line is one of the UK's leading price comparison and switching services for business and domestic energy customers. It is also an advocate for energy market reform and has campaigned for a better deal for energy users, including calling for a ban on cold calling and changes to regulations to make it easier for all consumers to switch suppliers. This service is completely independent and free. Consumers can quickly and simply search the market for the best available energy deals from an extensive panel of small and large energy suppliers. The service also offers a free advice line for business energy customers.